I remember playing the first Disney Infinity at last year’s E3 where one of the developers told me they were itching to get their hands on some Marvel (and Star Wars!) characters for future play sets. 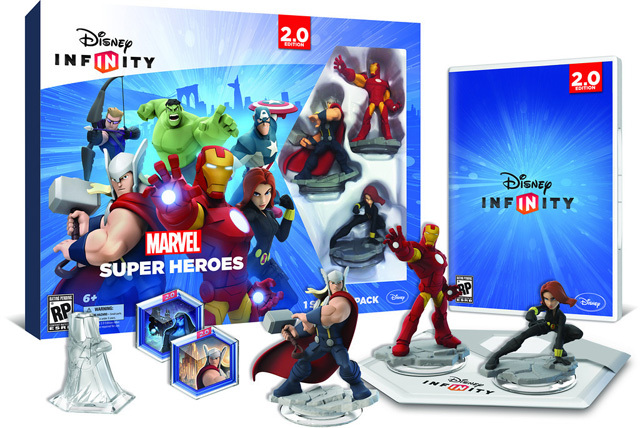 That is now a reality as the “2.0” version of the game, Disney Infinity: Marvel Super Heroes, is coming later this year and in addition to a number of new characters and vehicles comes some improvements to the gameplay and mechanics of the series. In the previous Disney Infinity, the various play sets were only capable of interacting with each other in the "Toy box" mode. Cars characters were unable to appear in The Incredibles play set and Toy Story characters can’t crossover with The Lone Ranger. In "Marvel Super Heroes" however this has been changed. Though the different play sets all come with their own characters and stories, you can mix and match them as you please. So if you want The Hulk to jump in and help out Spider-Man in his story or maybe you’d like to have Venom tag along with The Avengers, you can do that. Two play sets have been revealed, The Avengers, which includes Iron Man, Thor, and Black Widow, with Captain America, The Hulk, and Hawkeye sold separately, and the Spider-Man play set that includes the web head himself and Nova with Iron Fist, Nick Fury, and Venom sold individually. Each play set includes its own story that was supervised by comic scribe Brian Michael Bendis, with The Avengers taking on Loki and Modok and Spider-Man and company going up against Green Goblin, Mysterio, and Doctor Octopus. A third play set will be announced for the game in the coming months, and I’m told that a fourth one is still a possibility. The demo that I played for "Marvel Super Heroes" really cemented to me how much work has been put into the title. New York City has been fully constructed for the game with every inch being explorable. I played on the Spider-Man play set, and being a fan of the Living Weapon, I had to pick Iron Fist as my first character. The controls for the game are easy to pick up and the goals for the missions are simple and in true Marvel fashion see your character running (or flying) around the entire city to fight villains. Eventually I switched from Iron Fist to Nova, and what really impressed me about him was not only his power level (he can dispatch enemy symbiotes with ease) but his flying. Those who may have played LEGO Marvel Super Heroes might have had some complaints about the flying mechanics, which were easily disruptable, not the case for Disney Infinity. Flying is both easy and fun, especially when you get high enough and can swerve in and out between skyscrapers. With “Marvel Super Heroes” comes eighty new power discs for the game, forty for the Marvel end and forty for the Disney end. Among the Marvel discs are supporting characters such as White Tiger and The Winter Soldier, vehicles like Agent Coulson’s Lola or the Spider-Copter, as well as costume changes like Captain America’s WWII suit and Spider-Man’s black suit. These slight additions may not seem like much, but they really add to the whole experience of the game and fully complete the scope of the Marvel Universe in the game. 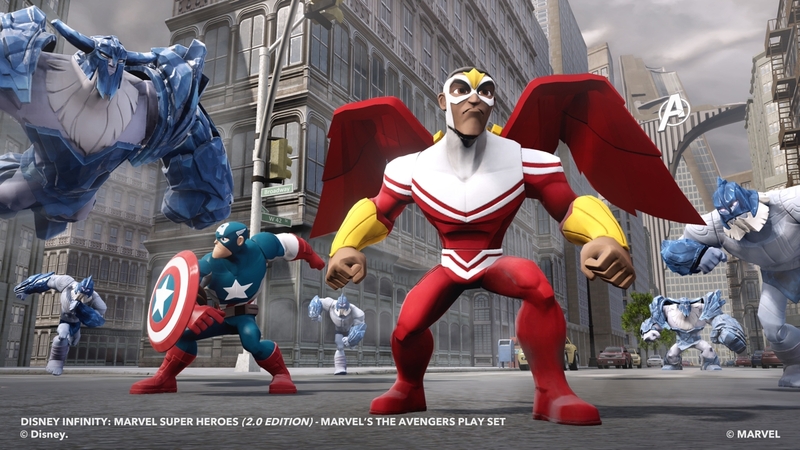 Disney Infinity: Marvel Super Heroes is an impressive feat. While the first incarnation of the game may have seemed like a Skylanders clone, the team at Disney Interactive have made the game their own and as far as I’m concerned have become the pinnacle of figure-based gaming. Fans of the previous Disney Infinity will no doubt enjoy the improvements made to the system while newcomers will be able to pick it up and have a ball. Disney Infinity: Marvel Super Heroes will be available for the PlayStation 4, PlayStation 3, Xbox One, Xbox 360, Wii U, PC and iOS tablets and smart phones this fall.